Following a programme over the last year the students of the Master Ma.Ma.In.D. - Marketing Management Innovazione e Design course at Fondazione ISTUD, one of Italy's most prestigious business schools are back at Mirafiori. Following a programme over the last year at Mirafiori, the headquarters of Fiat in Turin, this week has again seen the presence of the students of the Master Ma.Ma.In.D. - Marketing Management Innovazione e Design course at Fondazione ISTUD, one of Italy's mosdt prestigious business schools, which is located in Stresa and is noted in the field of higher vocational education and research on management. This year the programme is being stepped up with an extra focus on the powertrain sector, which in the age of a close environmental focus, is a key component in developing Fiat’s future product portfolio. The students are being led by a jury headed by Daniele Chiari, Director of Powertrain Portfolio Planning and Institutional Relations, and Massimo Debenedetti, the Head of Powertrain Planning, as well as representatives of the Human Resources department at Fiat Group Automobiles. The aim of the study is to realise a project focused on planning a range of future powertrain products for the Fiat, Alfa Romeo and Lancia brands spread across A- and B-segment, paying particular attention to engines with alternative power options, a pillar of the Fiat Group's strategic vision for its brands in the field of environmental protection. Two projects, both orientated around the planning of a range of cars that seek to maintain high competitiveness for the three Fiat Group Automobiles (FGA) brands on the European market without neglecting economic logic and respect for a realistic budget reference. To underline the value that the project work has for the participants of the Master’s course comes in terms of the training involved and the ability to exercise skills acquired during the course in order to become familiar with business dynamics and the complexity of working in marketing and innovation. 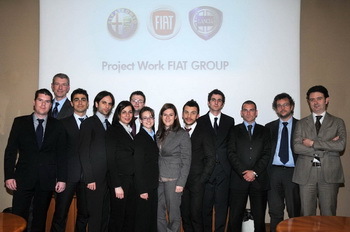 That the initiative has reached a second consecutive year confirms the success of the collaboration between Fiat Group Automobiles and Fondazione ISTUD, the prestigious business school in Stresa founded in 1970 and today very active in Europe in the field of higher vocational education and research on management. Bolstered its the successful experience of last year, Daniele Chiari expresses his confidence in the abilities of the students: "The collaboration with the Fondazione ISTUD fits perfectly with the will of Fiat to maintain close ties with academia and with the young talent of tomorrow. We asked students to develop a challenging project, the automotive market is very complex, but a fascinating subject in relation to industrial logic that poses major constraints for us. Reading the future is certainly challenging but it requires great effort and excellent analytical ability to identify with the reality of a business. This year we also agreed with the leaders of the Masters [course], to add a portion of work dedicated to powertrains, the fundamental sector for us to draw up the mobility of the future. We are confident that the enthusiasm shown by the students at the first meeting in February will certainly lead to good results and other interesting ideas." Enthusiasm for the initiative has also been expressed by the Director of the Masters’ course at ISTUD, Renzo Rizzo: "We are proud that Fiat Group Automobiles has called for a fresh and original perspective on the car market and we hope that their work is to high expectations and can be at least a little help in imagining the Fiat range of tomorrow. Furthermore, during the fortieth anniversary, the Fondazione ISTUD is proud to reaffirm the partnership with Fiat Group and is aware of the importance that such activity plays to build the students talents."